Consistency, maintains taste and quality every time. Maintain your signature taste. No dominant flavours, add your secret ingredients. Time Saving, marinates in just 4 hours. Tenderness, deeper absorption leading to tender juicy shawarma. Knorr Chicken Shawarma Marinade is the perfect base for authentic-tasting chicken shawarma. It was co-created with some of the best shawarma chefs in the Middle East ensuring best results time after time. 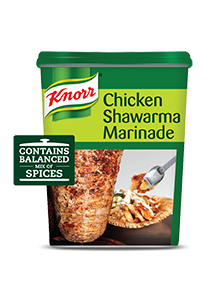 Knorr Chicken Shawarma Marinade has all the spices and flavour needs for an authentic shawarma base. It can also be used to give a Middle Eastern touch to your fusion dishes.